Hello! It's been a while. We've been off galavanting in Florida and waiting for our bedroom floors to come in, so not much has been happening around the house lately. But this weekend, we finally had some actual Spring-like weather, so we decided to spend the entire weekend outside. Since moving in, we haven't done anything to the outside except remove the above-ground pool and mow the grass. 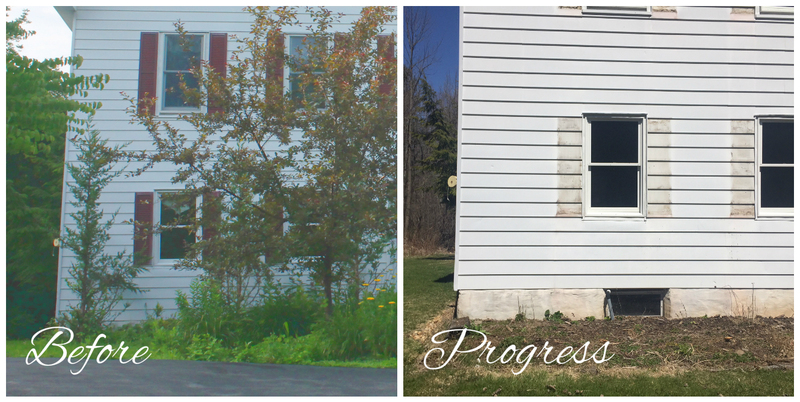 The exterior of our house is in need of some serious attention and TLC, and we knew pretty early on that this year would be the year of the shutters. 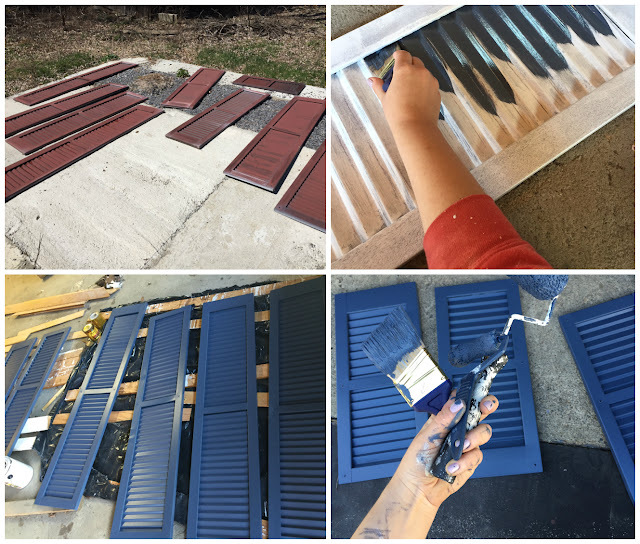 Our shutters were a kind of sad brick-red burgundy, and I knew that painting them a blue would give the whole exterior life. It took the entire weekend, but all but two of our shutters are painted. Josh started taking them down a few at a time during the week, and he discovered that our bee friends had been creating nests behind them. So, that was an adventure. He had to knock down a ton of nests just to get them to something that kind of resembled clean. 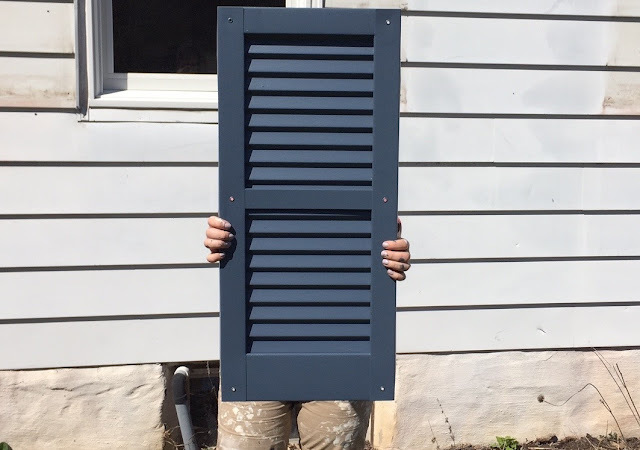 Then I gave the shutters a bath with the hose, towel-dried and primed them. That whole process took an entire day. Today, I was able to paint two coats on each one to finish the process. And I'm like, way too excited about how great they look. We wanted a deep blue that also had a little vibrancy when the sun hits it, so we decided on Newburyport Blue, which is a Historical Color by Benjamin Moore. They need to cure for a few days before they can go back up, but I'm so excited to see how different the house will look with such an easy and inexpensive change! While I painted all weekend, Josh started to clear out a lot of the landscaping that we don't plan on keeping. 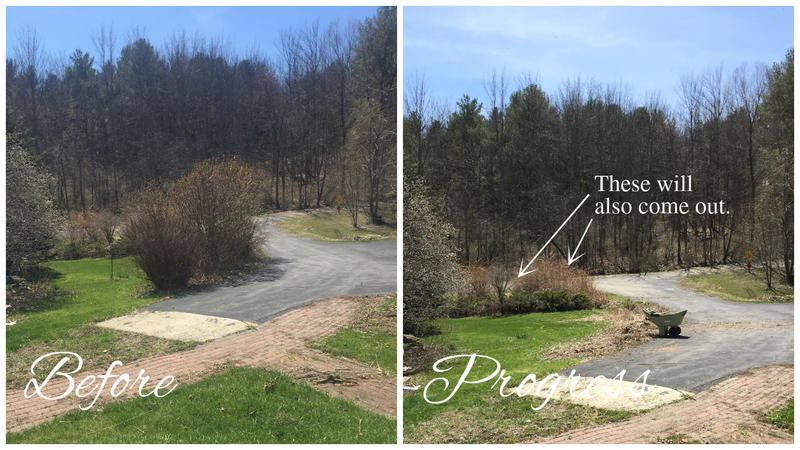 There were a lot of trees and overgrown foliage that were blocking the house and we, of course, want to start fresh, and open the yard up a bit. Looking from our front porch or kitchen window, the trees and shrubs along the driveway blocked our view, and we couldn't even see who was pulling into the driveway. So, they had to go. Our plan is to replace them with grass for now, and maybe add a fence for some curb appeal. 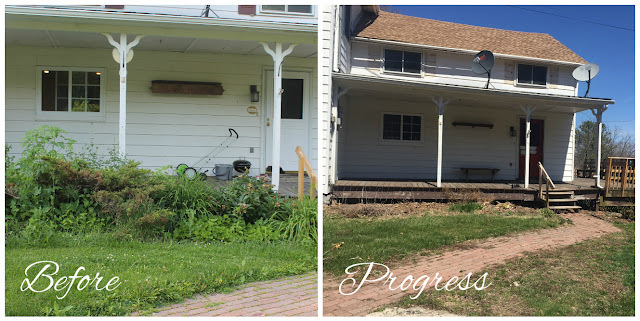 Josh also cleared out the overgrown plants in the front of our house. By our front porch, we plan on putting in some roses, dahlias and wildflowers, and in front of the windows, some pretty shrubs. It looks bare right now, but hopefully that will change as the summer progresses. Next weekend, we'll be back at work in our master bedroom because our floors will finally be here (yay! ), and in two weeks or so, we may be able to move in! And once the last threat of frost is gone, planting flowers can begin. I'm so excited about the weather being warmer, and tackling outside projects.